Chains will be clanging at the fourth annual Columbus Clash. 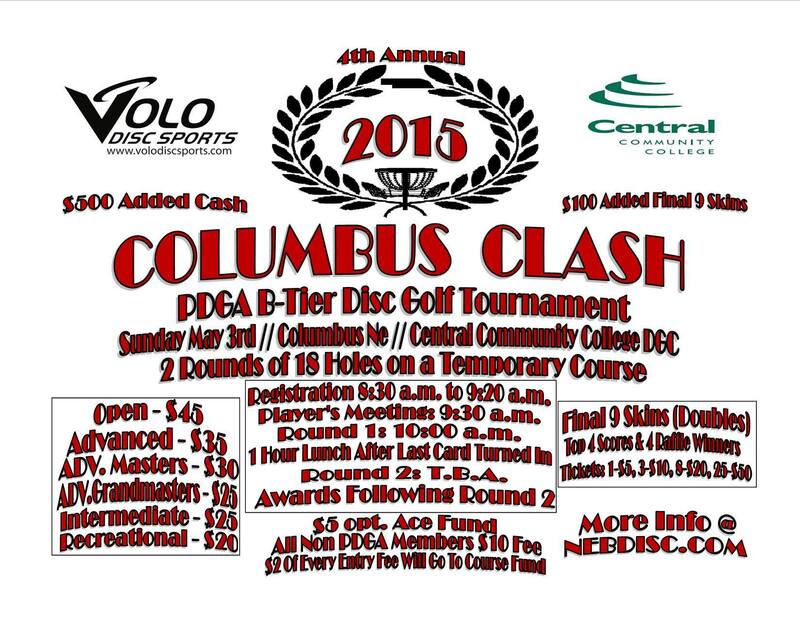 This is the first B tier sanctioned event in Nebraska for 2015 and will be held at the Central Community College disc golf course in Columbus, Nebraska. The course will be expanded to 18 holes for the tournament. Don’t have a rating? We can help decide which division based on recent course scores. $5 of the registration goes to the Star City Shoot-out regional fees * $10 fee for non-PDGA members over 19. Presented by nebdisc, vending by Birdie30. Join the PDGA and the $10 non-member fee is applied to your new membership! Not valid for renewing members.